Object recognition requires that you know when two shapes are 'similar'. But what does similar mean? The mathematician says: make the set of all (two dimensional, three dimensional or higher) shapes into the points of an infinite-dimensional space and then put a metric on this space reflecting what 'similar' means. The background image is supposed to suggest this construction: here a certain set of eggs with varying shapes are each put in its own pigeon-hole. If, for example, our 'shapes' are taken to be open subsets of Euclidean space with smooth boundaries, then this space will be a Banach or Frechet manifold, but a highly non-linear one. The question of finding the right mathematical model for the space of such shapes is not unlike moduli problems and I tried to get a grip on this as soon as I looked at vision problems. Around 2004 I met Peter Michor and found that he had systematically developed the foundations of differential geometry of such infinite dimensional spaces. This seemed to be the right tool for studying the above spaces of shapes. Since then, we have been studying various Riemannian metrics on them and their associated completions; the geodesics in these metrics and the curvature of the space; examples and applications to object recognition. The Representation of Shape (with A. Latto and J. Shah), in Proceedings of the 1984 IEEE Workshop on Computer Vision, pp. 183-191, 1984. Scanned reprint. The Problem of Robust Shape Descriptors, in Proc of 1st IEEE International Conference on Computer Vision (ICCV), 1987, pp.602-606. Scanned reprint. Mathematical Theories of Shape: do they model perception?, in Proc. Conference 1570, Soc. Photo-optical & Ind. Engineers (SPIE) 1991, pp. 2-10. Scanned reprint. Elastica and Computer Vision, in Algebraic Geometry and its Applications, ed. C. Bajaj, Springer-Verlag, 1993, pp. 507-518. Scanned reprint. Surface evolution under curvature flow (with Conglin Lu and Yan Cao), Special Issue on Partial Differential equations in Image Processing, Computer Vision and Computer Graphics, Journal of Visual Communication and Image Representation, 2001. Scanned reprint and DASH reprint. Geometric Structure Estimation of Axially Symmetric Pots from Small Fragments(with Yan Cao), in Proc. of Int. Conf. on Signal Processing, Pattern Recognition, and Applications, Crete, 2002. Digital reprint. The work with Peter starts here. Riemannian Geometries on Spaces of Plane Curves (with Peter Michor), J. of the European Math. Society, 8, 2006, pp.1-48. Digital preprint and DASH reprint and ArXiv preprint. Vanishing geodesic distance on spaces of submanifolds and diffeomorphisms (with Peter Michor), Documenta Mathematica, 10, 2005. Digital reprint and DASH reprint and ArXiv preprint. 2D-Shape Analysis using Conformal Mapping (with Eitan Sharon), Int. J. of Computer Vision, 70, 2006, pp.55-75; preliminary version in Proc. IEEE Conf. Comp. Vision and Patt. Rec., 2004. Stuff It! Review of Introduction to Circle Packing: The Theory of Discrete Analytic Functions by Kenneth Stephenson, The American Scientist, 94, 2006. Scanned reprint. An overview of the Riemannian metrics on spaces of curves using the Hamiltonian Approach, (with Peter Michor), Applied and Computational Harmonic Analysis, 23, 2007, pp. 74-113. A metric on shape space with explicit geodesics, (with Laurent Younes, Peter Michor and Jayant Shah), Rendiconti Lincei -- Matematica e Applicazioni, 19, 2009, p. 2557. Digital reprint and ArXiv preprint. . The Geometry and Curvature of Shape Spaces, talks at the Ennio De Giorgi Colloquium 2009 published by the Scuola Normale Superiore Pisa Digital manuscript. Sectional Curvature in terms of the Co-Metric and with Applications to the Riemannian Manifolds of Landmarks (with Mario Micheli and Peter Michor), SIAM J. on Imaging Sciences, 5, 2012,, pp. 394-433. Digital reprint and ArXiv preprint. Sobolev Metrics on Diffeomorphism Groups and the Derived Geometry of Spaces of Submanifolds (with Mario Micheli and Peter Michor), Izvestiya RUS, 77, 2013, pp. 109-136. A Zoo of Diffeomorphism Groups on Rn (with Peter Michor), Annals of Global Analysis and Geometry, 44, 2013. Geodesic Completeness for Sobolev Metrics on the Space of Immersed Plane Curves (with Martins Bruveris and Peter W. Michor), Forum of Mathematics, Sigma 2, e19, 2014. 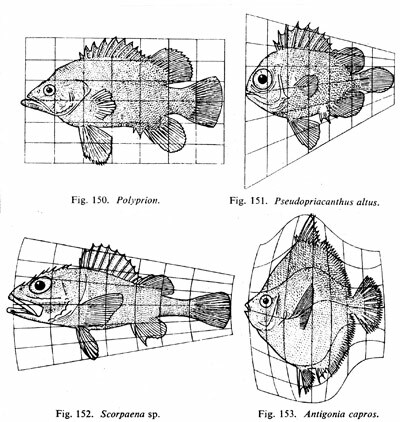 Four of D'Arcy Thompson's fish with a grid warped from the first fish. 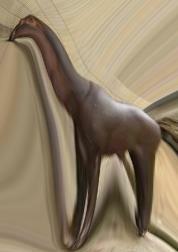 A hippopotamus was warped to the shape of a giraffe while retaining its own skin. 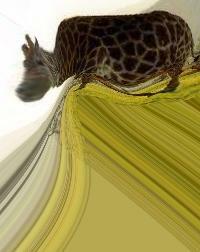 Now a giraffe was warped to the shape of a hippopotamus retaining its skin.